This particular green-leafed Japanese maple tree is leafing out, just as the tulips below begin to flower. A bag of pastel tulips planted a few years ago is reaching maturity, and will need to be divided this year. The yellow and pink flowers are so pretty, and the timing couldn’t be better as the tree is coming to life at the same time. I have been photographing this tree for a few days trying to get desirable light and a background on which the tree’s new leaves would show up. This morning’s photo was taken after the sun rose over the hills to the east; tulips are shadowed by the house. Categories: Uncategorized | Tags: flowers, Japanese, maple, pastel, pink, tree, tulips, yellow | Permalink. 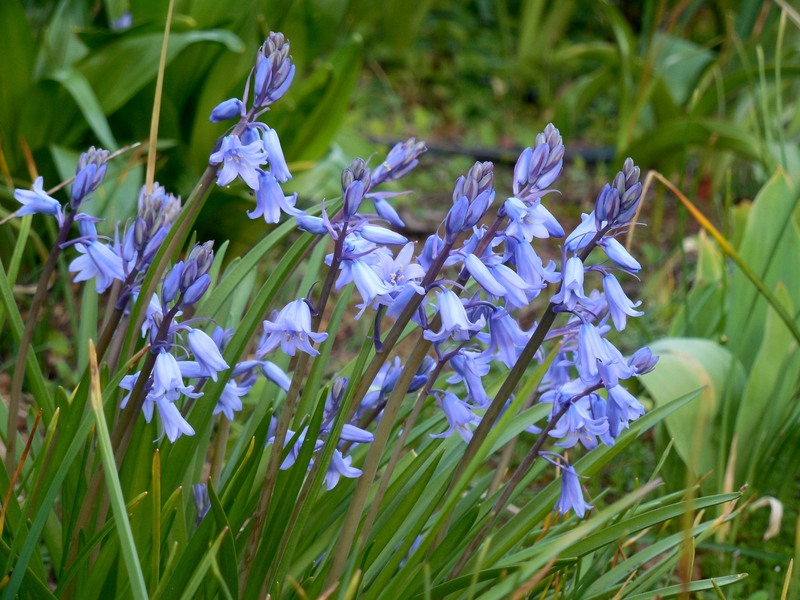 A shovel full of these bluebell bulbs were given to me over twenty years ago. I had seen them growing at the base of an old tree, so planted mine in a similar manner. 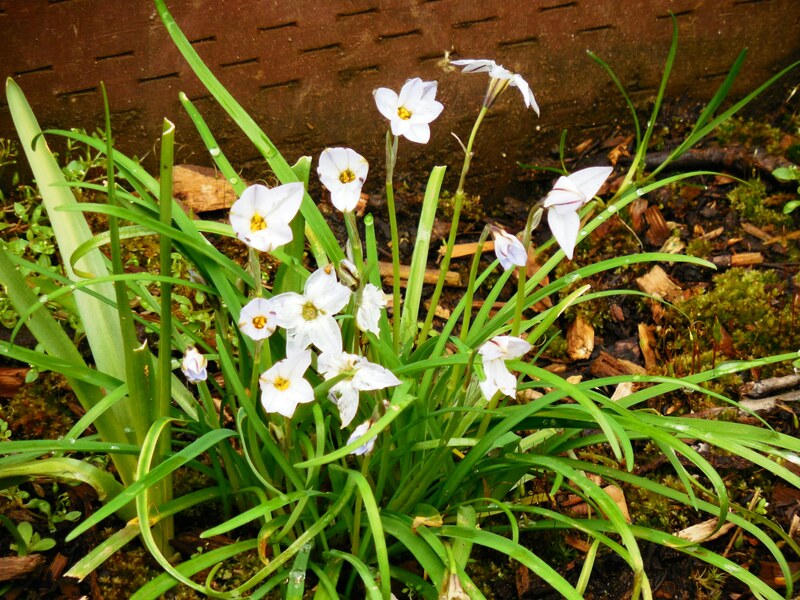 After noticing the leaf blades had been nibbled by wildlife, I moved my remaining bulbs into a fenced area. There they not only thrived, but multiplied profusely. I am now inundated with bluebells. 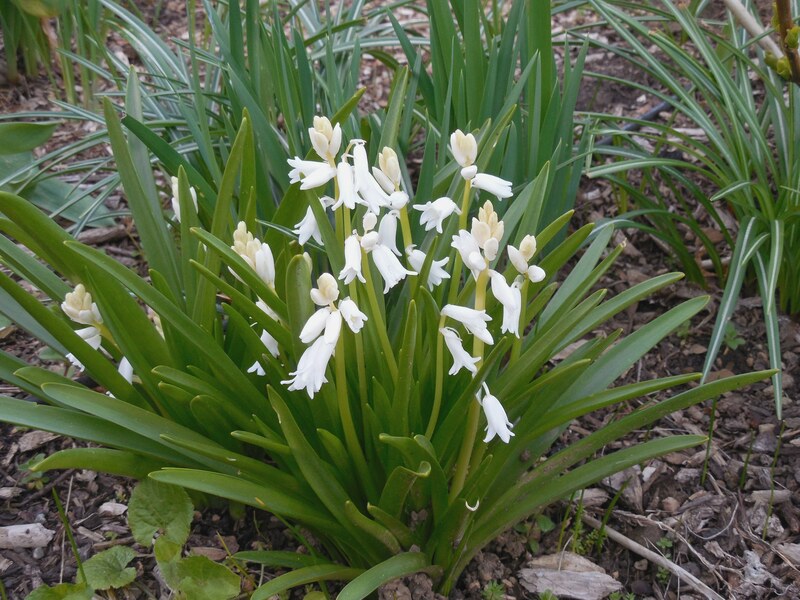 Somewhere along the line, I acquired what I called white bluebells – it sounds like an oxymoron! Shouldn’t they be called white bells? Or are they really lily-of-the-valley flowers? Therefore, I decided it was time to look them up. True Lily-of-the-valley flowers have significantly wider leaf blades, so I do not have those. Surprisingly, there really are (off) white bluebells, and they are not albinos! 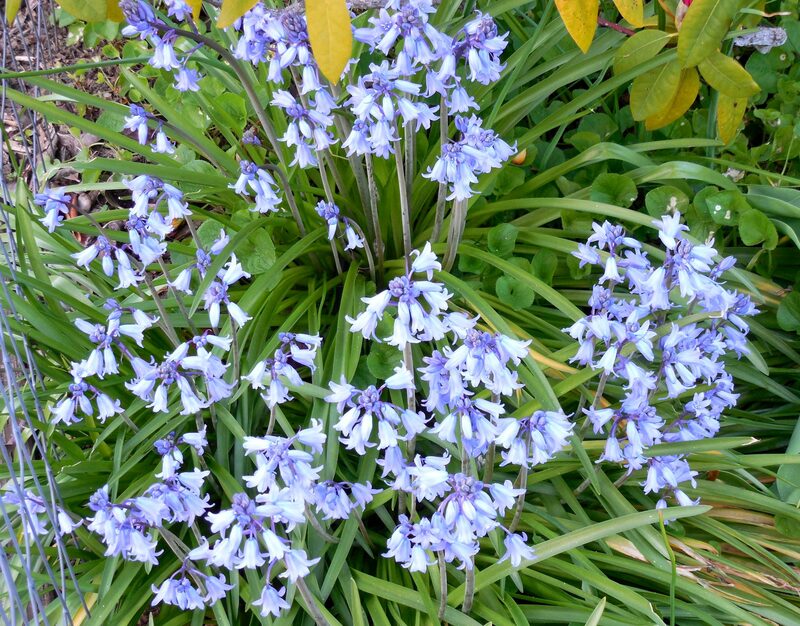 Online, I found many photos of bluebells that were drooping over. My bluebell flowers are definitely erect, and I concluded they must be Spanish bluebells. There is something similar called a Harebell, but that blooms in summertime, and is a different flower. Categories: Uncategorized | Tags: albino, bluebell, bulb, flower, harebell, lily-of-the valley, multiply, oxymoron, Spanish, white | Permalink. This is a little plant and a very small flower. It appears to me, to be a member of the viola family, but I am not able to determine exactly which one. An alpine viola is my best guess. In the upper right corner of the photo is a ‘normal’ violet leaf, which looks relatively large, but is not really. 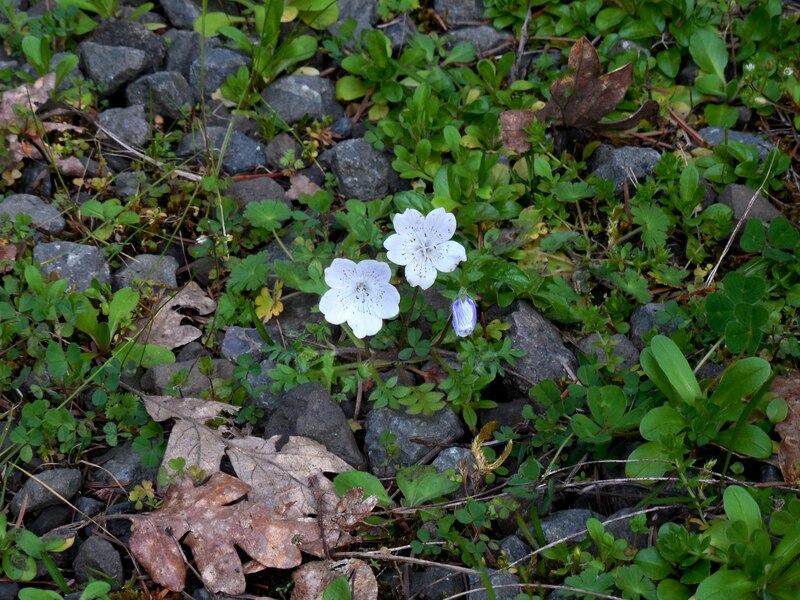 A gardening friend warned me this cute little flower can be invasive. So far, I still see it as a welcome addition to my haphazard flower garden. Although, it is moving in freely, I have no objections as it fills space and can bloom through the summer. I know I should be wary, as I spend too much time pulling out a plant I liked at first, but then became overwhelming. 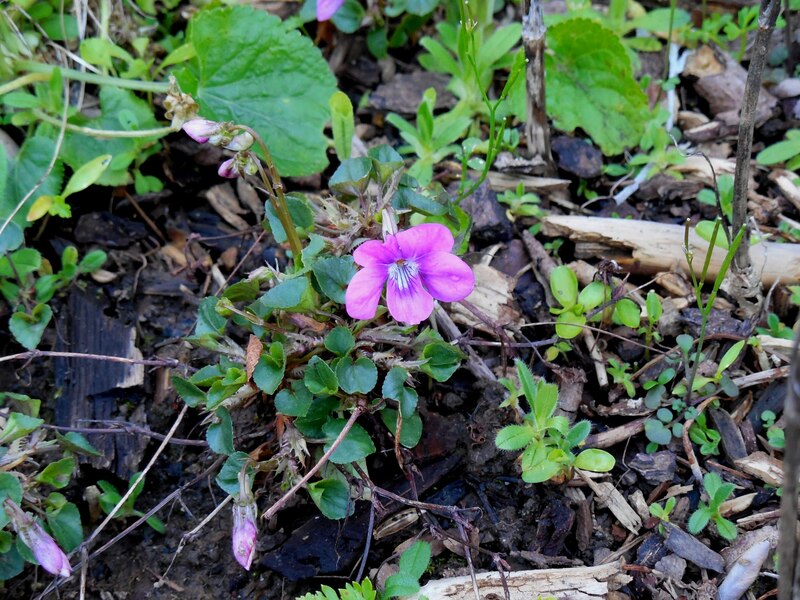 Categories: Uncategorized | Tags: flower, invasive, pink, small, tiny, viola, violets | Permalink. 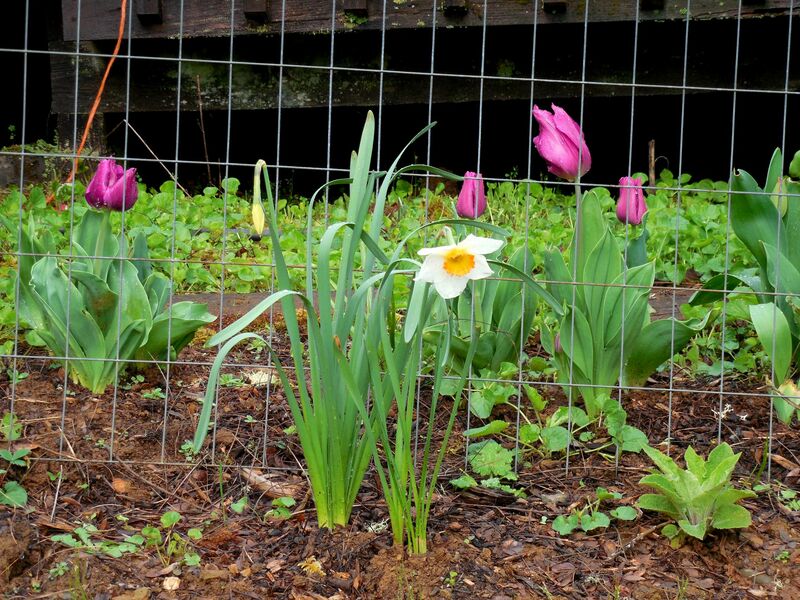 Tulips are safe in the “flower jail”, while daffodils keep guard on the outside. In the lower right-hand corner is a foxglove that is safe on the outside, also. Last winter, I found many foxglove babies inside of the flower jail. Since they do not need any protection from deer or rabbits, I transplanted many (I think I counted 74) to outer areas. I’m looking forward to many blooms later this summer. 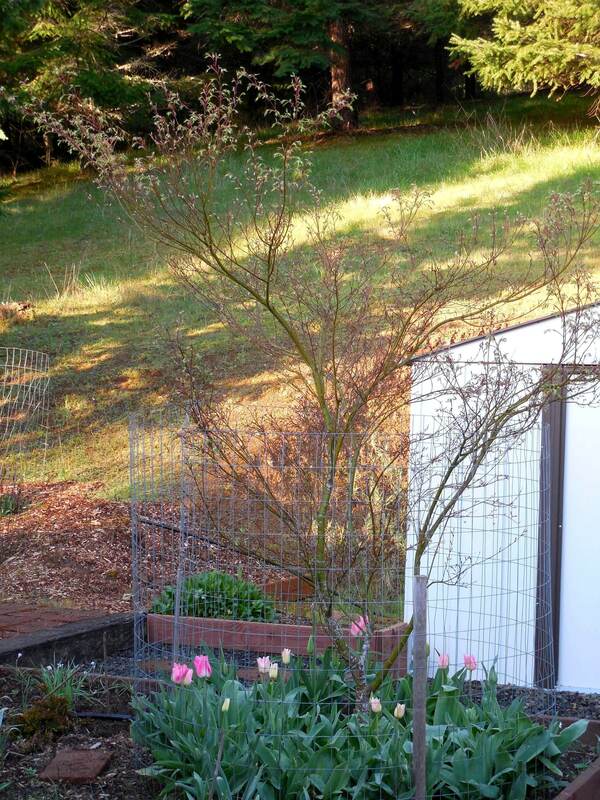 Earlier this week, I transplanted a hellebore outside the ‘jail’, to under some cedar trees. 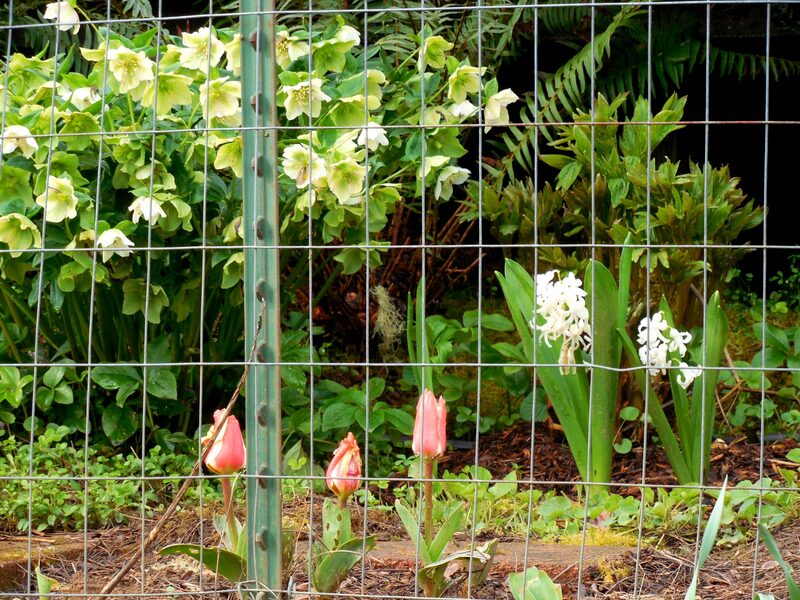 Deer are not supposed to eat them, so I moved a small plant as a test, to learn if my local deer have read the same book 🙂 I know the hyacinths and tulips need the fence for protection. Sure wish I could move the fence post away from my photo. These beauties live under an old rhododendron. It had been raining, so the tulips and windflowers are closed. 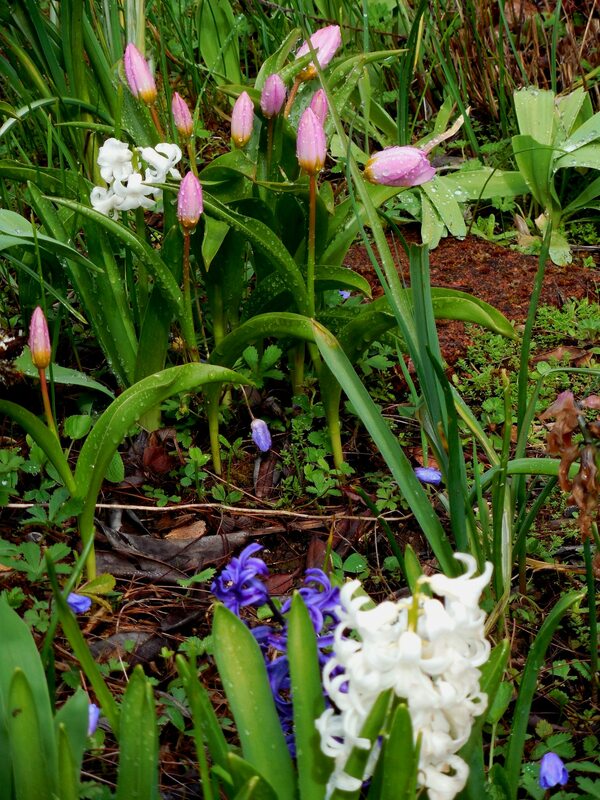 I was moving hyacinths around, and noticed how well the anemone windflowers are naturalizing themselves. They are so pretty in the bed, but I am now wary that they may take over and overwhelm the violets and wild strawberries that are ground cover. Categories: anemone, cedar trees, deer, foxglove, hellebore, hyacinths, rabbits, rhododendron, transplant, tulips, violets, wild strawberries, windflower | Permalink. This is one of our favorite reliable bulbs here. The leaves emerge in November or so, and give some needed greenery along the front of many flower beds until the flowers bloom in spring. Then we get rows of beautiful light blue blossoms. These bulbs have multiplied profusely, they have been shared and divided many times. I love the aroma they emit when I pull weeds that try to live amongst these small plants. 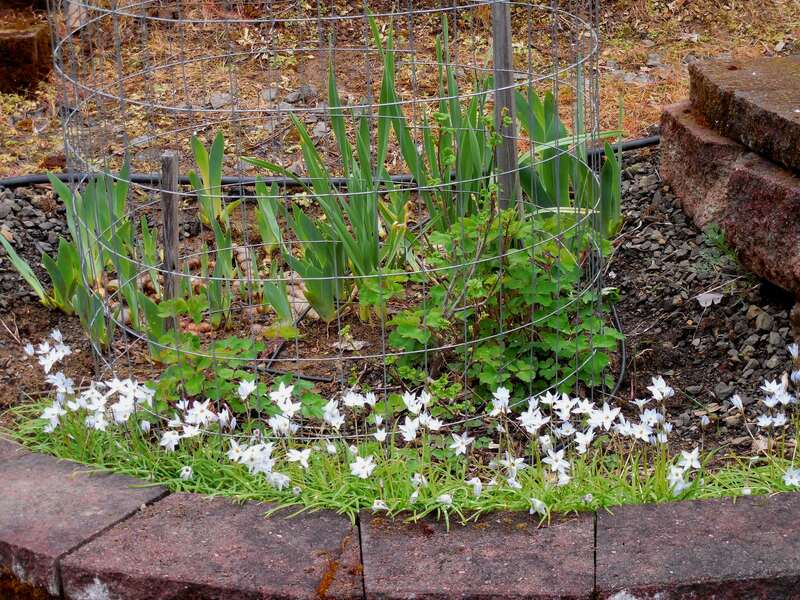 Chionodoxa are lush in front of these bricks, they will be ready to divide in another year. As these bulbs grow too thick through the years, they get divided to edge another bed. I have read that deer and animals are supposed to ignore these plants, probably because of their scent. The local animals have not read the same gardening book, as I always find some nibbles on the greenery. Remembering the name of these cute little flowers, has always been a challenge for me. A search in a catalog of spring bulbs brings it back to mind. Categories: Uncategorized | Tags: blue, bulb, chionodoxa, flower, glory-of-the-snow, Greek, small, spreading | Permalink. Just a small pot started this ground cover of phlox many years ago. Without any care, it has spread down a small hill. 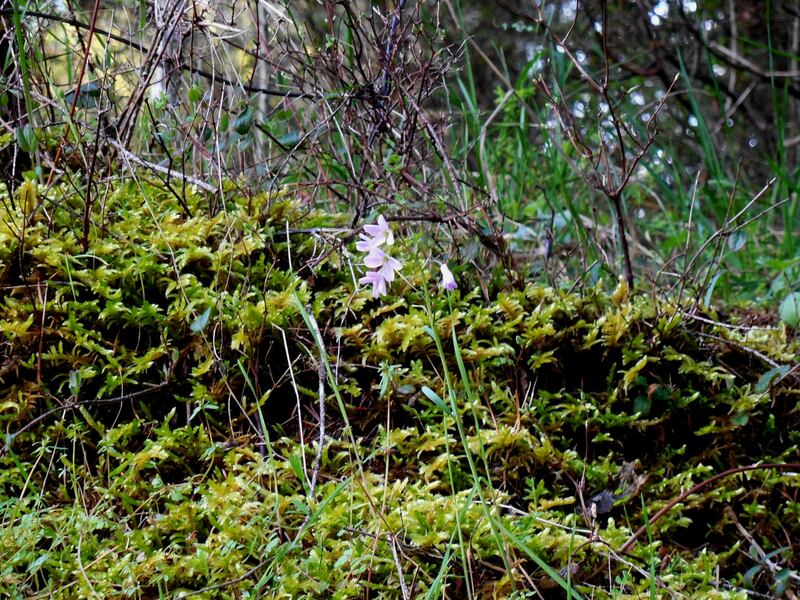 It is easy to forget until spring when many small pink flowers bloom. Deer and other animals ignore its presence. It gets walked on and treated shabbily, but keeps coming back. 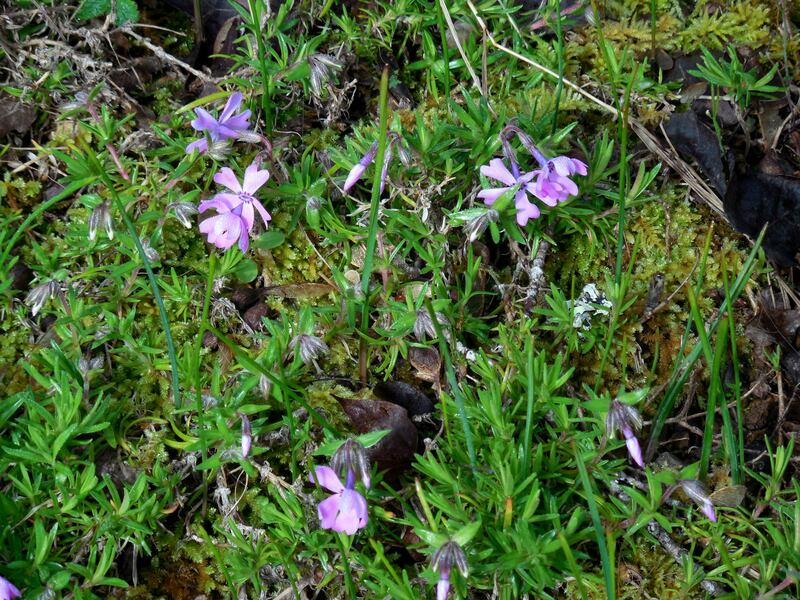 Categories: Uncategorized | Tags: creeping, deer-resistant, flower, groundcover, phlox, pink, spring | Permalink. In the left hand photo is a delicate flower referred to as rabbit ears or bunny ears. I have seen hundreds of these blooming under our scrub oak trees. The light pink bloom in the next photo, has a tall stem, and I have seen them sporadically for a few weeks now. They don’t seem to like too much sun, and there is lots of moss at the base of this one. On the right is a deer trail, with the same pink wildflower in the upper left corner of the photo. 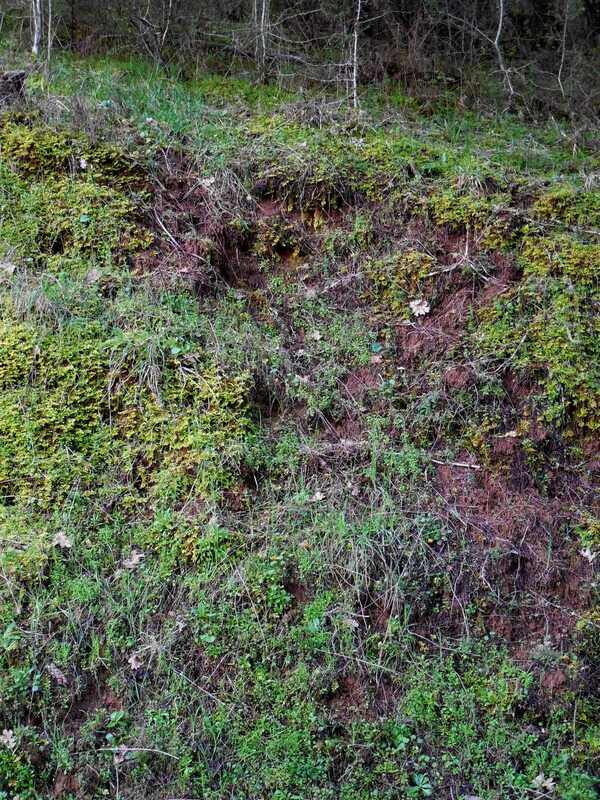 Deer tend to follow the same paths when wandering their “home area”, and the above photo is a worn path they use when climbing an embankment above a driveway. 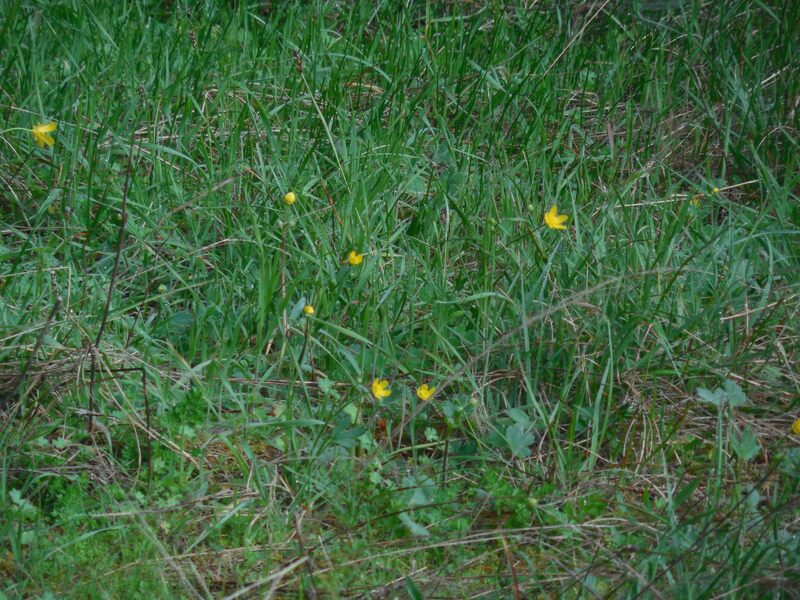 Here are buttercups, that surprised me one morning. They were above the hill where I dump my weed buckets and flower prunings. 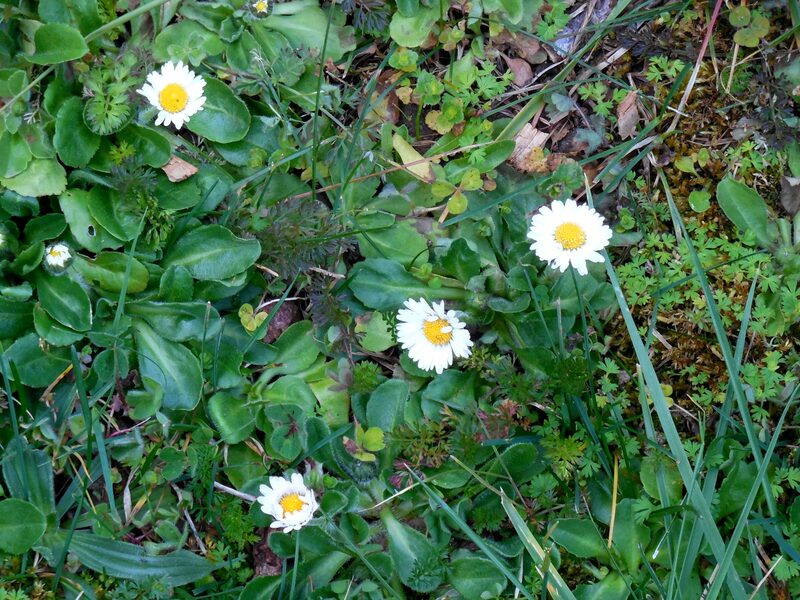 I’m not sure if these ox-eye daisies ever died out over the winter. They are everywhere, and I am constantly digging them out of my flowerbeds. 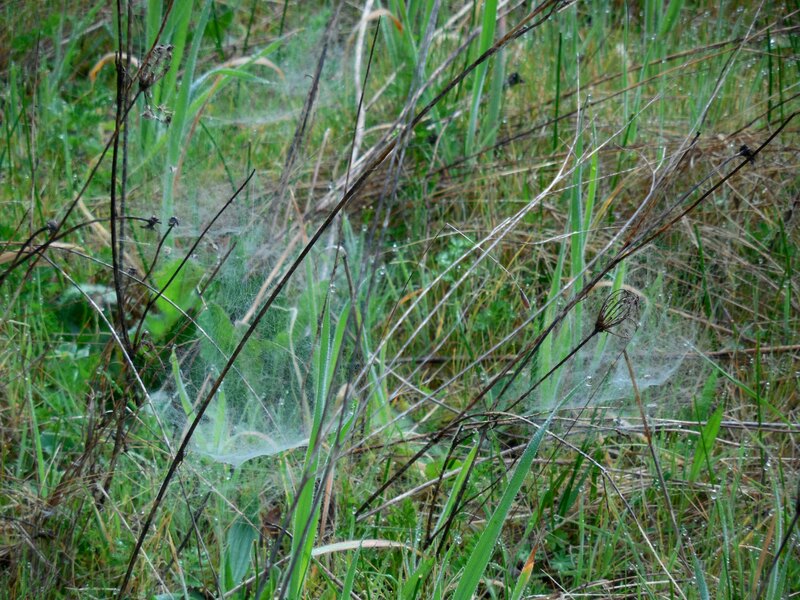 In the morning, it is not unusual to see spider webs in the grass. 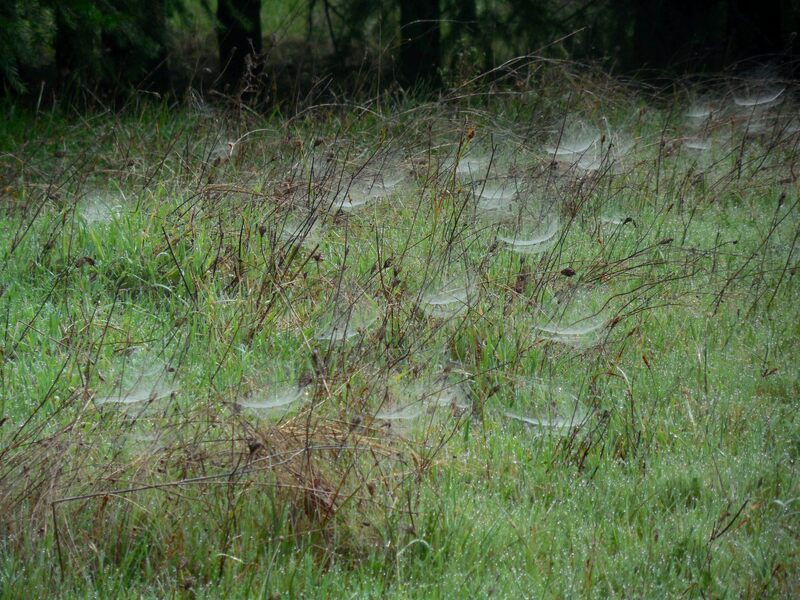 When they are wet with dew, they are easy to spot. I thought they were cool looking, so wanted to share the pictures. Categories: Uncategorized | Tags: buttercups, deer paths, morning dew, ox-eye daisy, spider webs, spring, wildflowers | Permalink.